When Larry Goodman met David Primes of Sobul, Primes & Schenkel 30 years ago, little did he know it would be the beginning of a lifetime of friendship and financial guidance. SPS has been a part of the Goodman family, all four generations! Somewhere around the time that Apple Computer wowed the world with its ground-breaking 1984 Super Bowl TV ad, a young accountant, David Primes, heard from a friend that Larry and Muriel Goodman, who had recently sold their food-manufacturing business, required accounting expertise. No big deal? Of course it was. The Goodman’s friend understood the importance of wealth management. That was a very special referral indeed, as time would tell. And so began the multi-generational journey of SPS with the Goodman family. Before too long the Goodman’s son, Donald, who was then starting his own Los Angeles based food-processing business, Don Lee Farms, enlisted the help of David after hearing his parents go on and on about the accounting assistance they were receiving. Fast forward 30 years and now four generations later, David is still providing the now-extended family with financial guidance. David has afforded accounting services and advice to the family’s parents, four children, 12 grandchildren and the recent addition of a great, great grandchild. 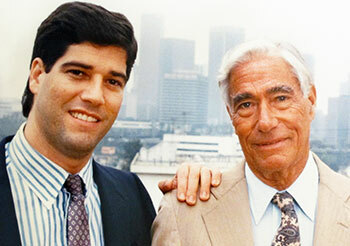 Donald and Larry Goodman, two of the four generation of the Goodman clents of Sobul, Primes and Schenkel. My Dad thought so highly of David he made him trustee of his estate. And then I did the very same thing. During the next two months, David, along with specialists on the SPS team, helped Don Lee Farms search for a seasoned CFO. That includes advertising, screening applicants and presenting two candidates to Donald, one of whom was hired.